What to do in Xel-há after swimming with dolphins? Xel-há has a lot of things to do and after swimming with dolphins, you will have more amazing options. Do you want to know more about them? Currently, Xel-há is an eco-archaeological park but, in early times, it was a commercial center for sailors. Its name means “where the water is born” and it’s surrounded by the Caribbean Sea, rivers and lagoons. You won’t find anything like it in the world! One of the biggest advantages of Xel-há is the great variety of activities apart from swimming with dolphins in Cancun or the Riviera Maya. The next 5 activities will make your visit very worth it! Would you like to see more than 90 marine species in their natural habitat? The entrance to Xel-há includes the chance of swimming in more than 5 different places in the park. Take the equipment with you and discover those stunning nature beauties! This may not sound very aquatic, but you can fly in a hammock or a swing and then, fall into the fresh waters of Xel-há. Travel at full speed and feel the adrenaline while appreciating the immense and colorful Mexican Caribbean. Xel-há keeps a lot of secrets of the antique civilizations. Inside this park, there’s a place where to see one of them. The Mayan Wall is a magnificent vestige of this culture and it’s waiting to be discovered by you! The sacred cenotes are water deposits located along Quintana Roo and Yucatan. For the Mayan people, they had a very special meaning for rituals. In the jungle of Xel-há, you will find two cenotes where you’ll be able to swim and enjoy them. If you want to exercise more after swimming with dolphins, biking is your choice! The route is short, less than one mile, but you’ll watch coatis, porcupines, tzereques (a type of rodent) and a lot of trees in the Chacahs Garden. 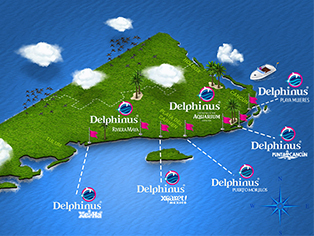 There are even more things to do after swimming with dolphins in Xel-há! Read more in our blog!